Throughout a groundbreaking, nearly 40-year career, Mary Sue Milliken finds the key to her success in following her insatiable curiosity. She is best known for Border Grill restaurants, trucks, and catering, which she runs with her business partner of more than 35 years, Susan Feniger. Mary Sue seeks to amplify the flavors of amazing ingredients, surprising guests with texture and color while maintaining harmony on the plate at every Border Grill location—Downtown Los Angeles, LAX, The Huntington Library, and Las Vegas’s Mandalay Bay Resort and Casino, as well as gourmet food trucks and catering. In June 2018, Milliken and Feniger debuted a fast casual eatery, BBQ Mexicana, at Mandalay Bay Resort and Casino in Las Vegas, and later this year they’ll return to Santa Monica with a new all-day Mexican restaurant. After graduating from Washburne Culinary Institute in Chicago, Milliken worked her way up and became the first female chef at Le Perroquet in 1978—where she soon met Susan Feniger. Following, she cooked at the woman-owned, two-Michelin-star Restaurant D’Olympe in Paris, before rejoining Feniger in L.A. to launch City Café in 1981, applying French techniques to unfamiliar dishes from around the world. The culinary pair found further acclaim with CITY Restaurant in 1985, and captured the hearts of Angelenos with Border Grill’s ’85 debut, evidenced by a James Beard Award the same year. Milliken and Feniger brought their innovative approaches to The Food Network with the “Too Hot Tamales” and “Tamales World Tour” series, along with the Los Angeles’ popular food-centric radio show, KCRW’s “Good Food.” In 2011, Milliken competed on season three of Bravo’s “Top Chef Masters” and won $40,000 for her chosen charity, Share Our Strength. She has also co-authored five cookbooks. Milliken uses her platform to enact societal change, serving on the boards of both Share Our Strength and the James Beard Foundation. 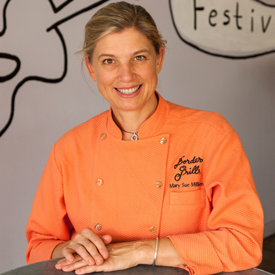 In 1993, she joined other progressives to found Women Chefs & Restaurateurs and Chefs Collaborative, and she was later selected to join the U.S. State Department on the American Chef Corps to promote diplomacy through food in Pakistan, Malta, and Italy. Her passion for sustainability led her to work with L.A. Food Policy Council, Pew Charitable Trusts, Oxfam, Monterey Bay Aquarium, and others. In In 2018, Feniger and Milliken were named the recipients of the fourth annual Julia Child Award from The Julia Child Foundation for Gastronomy and the Culinary Arts, marking the first women to be honored. The distinction complements additional accolades, including the Elizabeth Burns Lifetime Achievement Award from the California Restaurant Association in 2013; earned induction into Menu Masters Hall of Fame in 2014; and the 2018 Gold Award from the Los Angeles Times for culinary excellence and innovation in Southern California.